This hop is scheduled for Saturday, March 10 through Sunday, March 11. There will be different DT Ladies posting each day so come back on both days to see everyone’s fabulous projects and to make sure you qualify for the prizes being offered. We are looking forward to Spring at CK2 and wanted to share with you some of the fabulous files we have at CK2 to make adorable gifts for St Patrick’s Day next weekend and then Easter is coming up Soon too. If you just came from Dana then you are in the right spot. We're so excited to be doing this hop and we have a fabulous lineup each day with some very talented ladies. There will be lots of fun projects, along with some great blog candy, and a great grand prize for this hop. The grand prize for this hop will be a $10 Gift Certificate to Both Creative Kuts and Creative Kuts2 Stores. Plus your chance at Winning the Sizzix 17-Piece Texture Boutique Value Kit when we reach 300 Followers. RULES: In order to be eligible for the grand prize, you must follow each blog and leave comments on each blog both days of the hop. Also Hop over & LIKE our FB fan page https://www.facebook.com/pages/Creative-Kuts/130937843644274 and leave a comment there that you are hopping by from this hop. I made my project using wondeful files from CK2, the first one is the Tower Egg Box and the second one is the Egg Box, you can find them HERE, hope you guys like it!!! THANKS!! Please Hop to Sandra NEXT. Thanks so much for Hopping with us today. Please come back tomorrow to see the rest of the fabulous projects done by the rest of our AWESOME design teams at CK & CK2. Love them Gaby!!! All of the embossing looks wonderful and I love the little egg tag you have added for the tower box!!! Very cute projects! Love the embossing! Adorable project, Gaby. Great job!!! Love It Gaby, Great Job! Love the colors, and the embossing on the eggs!! Great job, Gaby!! Eggactly what any bunny would love! Wonderful job Gaby! You have come a long way in such a short time. Beautiful staging. Thank you. Your Egg boxes are adorable!!! Thanks so much for sharing, your adorable boxes. Love it Gaby!!! Great Job, TFS! Way to go chica! Great job! So very cute!! Great job on these! Such cute and colorful boxes! 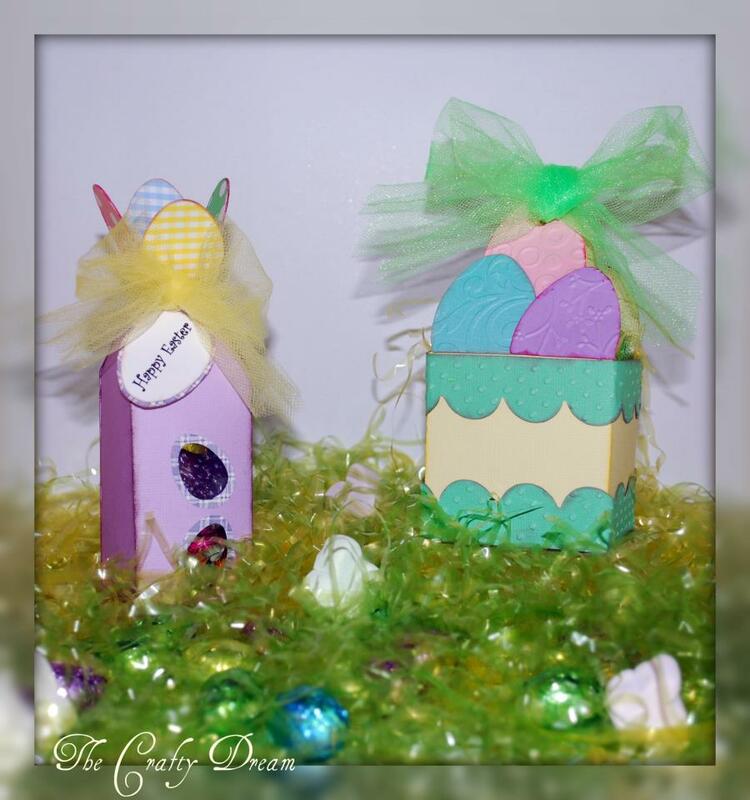 Such cute gift boxes for Easter. TFS! Just hopping by to say "Hi" and see your cute projects! Thanks for sharing! Off to finish the Bunny Hop! Love the tulle you added to your project. New follower. Fantastic boxes- anyone would be happy to get these filled with joy at Easter. Each are festive projects. Functional is always a bonus! love your project! so colorful very festive. I am just loving all the fun easter projects on the hop! Cute baskets!! wow. these are fab. love them.